Pretty much every day since last week, any time I hop onto social media I see someone I know taking the scenic route on a summer adventure! Including my eldest daughter who traveling through Europe right now. School is out for the summer in many places. We still have a few weeks left to go here. While a short day trip to Portland last week was a small scenic adventure, we're still wanting to go and explore more! We have a few plans lined up to do just that this summer/fall. While we have some more time to kill before then, we are working on summer show inventory. I'm super excited to jump back into show season. It's so great to connect with our customers and chat in person. First show on deck for us is Urban Craft Uprising's Summer Show. It's a personal long time favorite of mine. I've vended at it since it's inception, only skipping a couple shows. The organizers, volunteers, fellow vendors, sponsors and attendees are always the best. THE BEST! We're excited for that weekend! Mark your calendars and come see us okay? It's a booth share with my other company. Okay dear friends and family keep posting those amazing travel pictures for me to eye guzzle until it's our turn! D'oh! I failed to hit "post" before we headed east! But we are here in Chicago! Today you can catch us in the Wicker Park neighborhood of Chicago at the Renegade Craft Fair From 11-7! We're in booth #284 near the beer! Day one was incredible and we sold out of a few things! So today we're going to put most of what we have left on sale! Hi!!!! I know most of you keep up with us through our Instagram (I post there almost daily!) we're in Anacortes this weekend for the Anacortes Arts Festival. Such a random place for us to be you might think. But actually Anacortes is my second hometown! My mom has lived in Anacortes most of my life and it's really not far from my real hometown of Oak Harbor on Whidbey Island. In all my years of being a maker, this is the very first time that I will be vending near home! We are located near the brewery (It's like the event coordinators know me!) in booth number 311C - in the center! The festival runs Friday 10am to 7pm - Saturday 10am to 6pm and Sunday 10 am to 5pm! Come beat the mainland heat in the much cooler temps on Fidalgo Island! We're bringing clearance items AND our keychains! We actually will have keychains on hand!!! To top everything else off, our daughters oldest Jina & the Blonde (Nieves) will be taking charge and taking on the family business by vending at Magnolia Summerfest's UCU Maker's Market in the Magnolia neighborhood of Seattle! It's Seafair Weekend! You know you'll be out about so be sure to see our girls at Summerfest! Lasers and love - Thea and the 6 by 6 Family! Hey, hey, hey...we will be out and about this summer! First show of the season will be on June 24th -25th at the Urban Craft Uprising's Summer Show at the Seattle Center Exhibition Hall. 6 by 6 will be booth sharing with Thea Starr - totally weird to talk about myself in the third person. 11am to 5pm both days. Next up in early July we'll be hitting the road and heading south to Los Angeles for the 9th annual Renegade Craft Fair LA! It's an outdoor show held at the Los Angeles State Historic Park on July 8 – July 9, 2017 11 am to 6pm both days. Next up in August we'll be in my hometown area at the Anacortes Arts Festival! Another outdoor show in the very cute town of Anacortes. My mom worked at Island Hospital for almost 20 years so I got to spend a lot of time in Anacortes when I was younger. The Arts Festival is a three day event. Held right smack dab in the middle of town on Commerical Avenue. August 4, 5 & 6, 2017 Friday 10am - 7pm Saturday 10am - 6pm and Sunday 10am to 5pm. Lastly, another outdoor show, we'll be at Magnolia Summerfest in association with Urban Craft Uprising. Held at the West Magnolia Playfield (South) on August 5th & 6th, 2017 (Seafair Weekend!). 9am to 5pm both days. So, mark your calendars! Create lists for those who need gifts or lists of stuff that you want and come see us in person. We'll have new products and clearance items too. Our adult children will be present at a couple of the shows helping out, so it will truly be a 6 by 6 Arts family production. While we didn't have our keychains at the show (thank you so much to our online customers who stopped by asking for them specifically) we did sell out completely of all of our keychains over the weekend. I know, I couldn't believe it either. But to add more bad news to the bad news, we won't have them in stock again until after the New Year. Since we process the reclaimed wood all ourselves they are labor intensive. All remaining inventory we have is committed to our stockists. Which many carry our keychains. So if you've been hoping to get one and needed to do some holiday or selfish shopping, please check out one of our stockists in person! Ack! We're so excited to announce that we will be vending at two large craft shows this winter season! We wanted to do a few more shows and will be doing one private event in mid December, but there is only so much time on the calendar. So we had to choose wisely and hoped that we got picked and we did! Our first show is a month away! We will be vending at our first ever Seattle craft show - Urban Craft Uprising. I (Thea) am no stranger to this show. I've been a vendor in every single UCU show up until this one. But I am more than excited to be bringing my new company to the show. It's fun to mix it up a bit. This show is so much fun! There's even a Preview Night and for the first time ever there will be adult drinks! Preview night is December 2nd and entry is by ticket only. For more information about Preview Night check out the link here. Details about the open to the public show are available below - entrance is free! 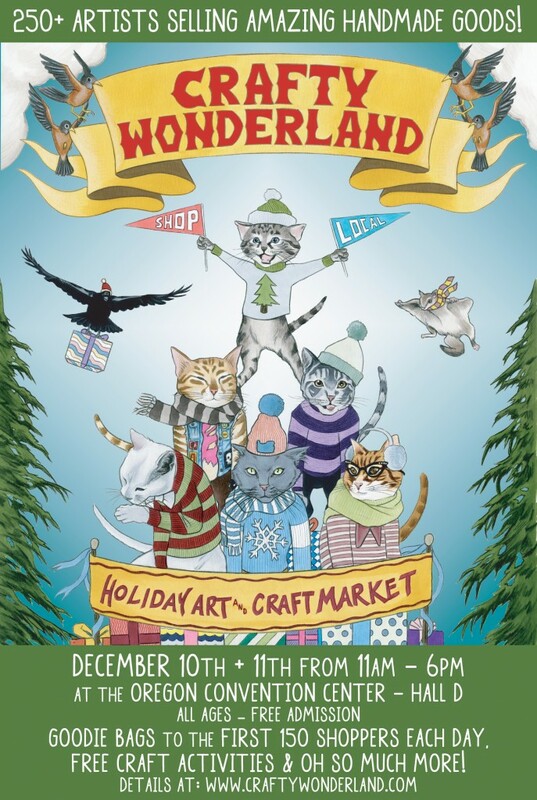 After a super fun weekend in Seattle, we will be heading down to Portland for our return to Crafty Wonderland's Holiday Art and Craft Market!!! Crafty Wonderland will also be hosting a ticketed First Pick Pre Show Party. More information about tickets are available here. Details about the open to the public market is below and entrance is free! We are so excited to be vending at both of these shows! We're excited to meet with new and returning customers and catch up with our fellow makers too! Mark your calendars and start making your lists! Both shows are unique and have their own vibe. I can't recommend them both enough! We had an amazing weekend in Portland at Crafty Wonderland! Our fellow makers will attest, that doing shows like these are quite the work out. Set up, the show itself tear down and unloading. Not to mention the actual work of producing your products. I've burned all the calories I consumed at Red Robin, in just a few hours. I wouldn't trade it for the world. We doled out a lot of "hater bonding" signs over the weekend. Its really quite fun! We love answering questions about our work in person and getting to actually meet them too! The organizers behind Crafty Wonderland run a tight and awesome ship! 20,000!!! Shoppers came out over the weekend to support handmade. It was truly amazing. Thank you to each and everyone of you who came to the show and especially those who stopped and shopped at our booth. This was our third craft show. What a way to end the first full year of business for us! We had a great time hearing feedback about our work. The geek appreciation for our D20s and other D&D themed items. Our PNW lifer wares are a big hit, us PNW folks love our area! Ans our sentiment signs we're the most discussed as you can guess. I don't think it will ever get old seeing someone stop dead in their tracks after reading "We Hate Everything Together" and bursting out in laughter. There was an older woman who stopped by and purchased one and looked me right in the eye and said "That is love." As you can see, we have another "sweet sentiment" sign. "I Like Most Things About You" - I'll try to get it listed ASAP. It was quite a conversation starter at our booth. As if "We Hate Everything Together" and "BoozeMe" wasn't enough. It's heartwarming to know that love and humor is a constant with everyone. Yes, that is our 13 year old faking a nap in the middle of the show next to our Spend Your Fucks Wisely sign. Don't worry, we teach her lots of other words. Although I feel strongly about about the words of wisdom on that sign. Thanks again so much Portland! You have been nothing but absolutely awesome to us. Crafty Wonderland Super Colossal Holiday Sale!!! We just wrapped the Preview Night event at Crafty Wonderland. We are beat! We had a late night last night (where I chickened out from driving over crazy roads that were flooded to get my daughter to volleyball practice - I turned around about half way there.) We hit the road bright and early this morning to get to Portland in time for load in for the show. A bit of rain but otherwise all clear. No tornados or mudslides. Anywho - tomorrow is the regular (regularly awesome) annual weekend show. OPEN TO THE PUBLIC – FREE ADMISSION - ALL AGES! We're in booth #154! If you are in the Portland area please stop by and say Hi! We have our "classics" (we're barely over a year in business can we even say we have a "classic?!?!") Also, we've debuted a new sign! "I Like Most Things About You" - Just like our "We Hate Everything Together" its a sign that simply states the truth. We're hitting the hay in a bit to get some good rest for the show tomorrow. Renegade Craft Fair San Francisco is tomorrow at Fort Mason Center's Festival and Herbst Pavilions. We will be in the Herbst Pavilion, booth #232B. We're so excited to be in California (can you believe it's actually cooler temperature wise than it is back home in Seattle!?!?) and to be vending at this show. If a Renegade Craft Fair happens to be coming to an area close to you, I highly recommend checking one out! Off to unpack our bags and hope everything made it down with us in one piece. Friends in the San Francisco area, we're looking forward to seeing you!!!! All the details about the show this weekend is available by clicking through this link.